Scaling up male circumcision (MC) coverage to 80% of men and neonates in South Africa over the next 5 years would avert more than 1 million new HIV infections by 2025  but this is unlikely to happen. 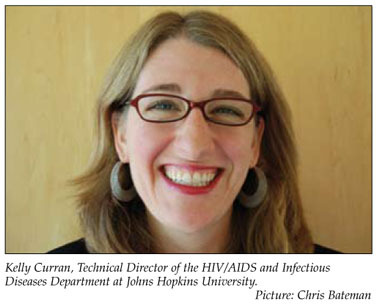 The startling prevention claim emerged from modelling data presented by Kelly Curran, Technical Director of the HIV/AIDS and Infectious Diseases Department at Johns Hopkins University, who was in Cape Town this October to attend an AIDS/TB meeting of global researchers. She told Izindaba that MC trials in Uganda, Kenya and South Africa had shown a 60% reduction in HIV infection among heterosexual men, prompting aggressive World Health Organisation (WHO) guidelines for high HIV, low male circumcision prevalence countries 2 years ago. 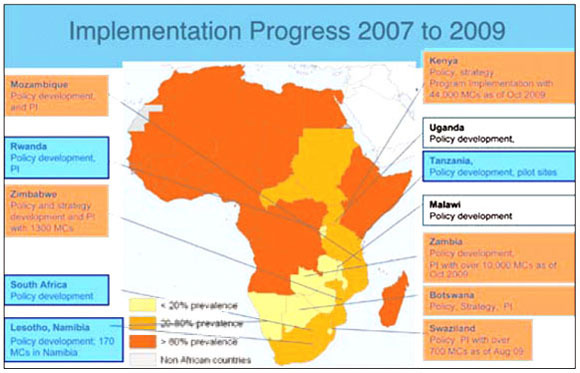 The goal now was to increase the scale-up of MC coverage among young men to 80% over the next 5 years in 13 eligible countries in Africa's East and Southern regions, namely South Africa, Namibia, Botswana, Swaziland, Lesotho, Malawi, Zambia, Zimbabwe, Mozambique, Tanzania, Kenya (Nyanza Province only), Uganda and, Rwanda. Nyanza Province in Kenya was identified because it had low male MC coverage and an HIV prevalence three times higher than the rest of the country. Curran said that in spite of the start-up difficulties, the pay-off was huge. Modelling exercises suggested that the cost of averting an estimated 4 million new HIV infections in the 13-country region over 5 years would be around R7.5 billion  eventually saving R150 billion in treatment costs. 'That's a pretty small investment for such a big return,' she said. Similar modelling predicts that a scale-up of such magnitude (over 5 years) would in South Africa alone avert 20% of new infections and avoid more than 1 million new HIV infections in 15 years' time (when the incremental effect has kicked in). Reaching 80% coverage in all 13 countries would require approximately 28 million procedures over 5 years. To stress just how effective male circumcision was, Curran said a modelling exercise in Swaziland assessing the number of procedures that were required 'per infection averted' showed that as few as five circumcisions would avert one infection. This had 'huge potential' for countries with high HIV incidences such as South Africa. However, the consensus view at the South African National Aids Council (SANAC) is that MC should be introduced next year as part of a broader, strongly broadcasted package of sexual health and behavioural interventions. Professor Helen Rees, head of the Reproductive Health and HIV Research Unit at Witwatersrand University (RHRU) and co-chair of SANAC's Programme Implementation Committee said a plan to upscale the provision of MC within this context was currently being developed. The process had engaged SANAC's civil society sectors on the science of MC for HIV prevention while providing a platform for sharing views on policy development and implementation. Traditional leaders were involved in discussing the balance between traditional circumcision practices and medical male circumcision as well as concerns about unsafe circumcision practices outside the realms of established traditional practices. Professor Francois Venter, President of the HIV Clinicians Society of South Africa, a senior Director at RHRU and an MC advocate, stressed that it would require 'serious energy, money and resources' for an effective scale-up of what he believed should be a stand-alone service. He downplayed other oft-cited barriers to implementation such as culture and risk disinhibition, saying the former was often driven by vested political interests under the guise of protecting traditional healer turf. He described MC as 'an incredibly exciting' way of accessing men who as a group are notoriously elusive when it comes to addressing their health. It would create unprecedented opportunities for counselling on HIV risk reduction, gender violence and alcohol abuse, plus STI treatment and HIV testing. Women, by contrast, regularly accessed the system (family planning, pregnancy, birth, and maternal and child care). Alluding to the initially fatally slow local ART rollout (a handful of pilot sites), a frustrated Venter said South Africa suffered from 'the disease of too much analysis and too little implementation'. An MC operational programme would need workers, facilities, advertising, focus and project planning with intellect 'to make it real. It's like building the Gautrain: it won't happen by itself", he added. Observational data for the nine South African provinces showed 'no evidence' that HIV transmission between 1994 and 2004 was slower in those provinces with higher levels of circumcision2  though non-medical MC is known to be less effective. Western Kenya currently leads the MC field at 44 000 procedures towards their 150 000 per year goal (most of them done in the last year), followed by Zambia at 12 500 in two years (with 2 million to go). Curran told Izindaba that 'the first 1 000 MCs are the hardest because you have to get systems, training and commodities in place, just as you had to with ART'. Some six to seven years ago many influential people were saying that scaling up ART in Africa was 'impossible'. 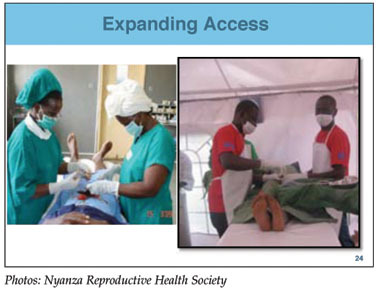 'It (male circumcision) needs a massive scale-up  a few pilot sites here and there won't do it,' she emphasised. Curran quoted the WHO's description of MC as 'a landmark in the history of HIV prevention'. She was presenting data at the annual Investigators Meeting of the international Consortium to Respond Effectively to the AIDS/TB Epidemic, (CREATE). Addressing questions about resistance to MC, Curran said that she and fellow advocates had learnt the hard way that pure clinical trial data were often not enough to convince policy makers, clinicians and patients to act. However, when biological data were added, the picture often became more meaningful for them. She explained that this involved describing how circumcision prevented HIV infection by removing the foreskin where a profusion of immune system target cells resided. It was also crucial to provide 'a space for detractors' to air their concerns. 'It's easy to say, please, look at the evidence, but people's personal beliefs drive much of how they see the world. There are valid concerns for example, about whether women will still be able to negotiate condoms and whether it would act as a disinhibitor for young men (long-term follow-up at the Kenyan trial site found no evidence for the latter). She said another effective motivator was 'benchmarking' or applying peer pressure among countries. This happened in Windhoek in June this year, where a stocktaking of progress since the WHO and UNAIDS issued their country guidelines on MC in March 2007, called 'Two Years and Counting', took place. The ministries of health and national AIDS councils from most of the 13 countries involved, plus a handful of researchers and some NGOs attended, each country presenting a status report before being grouped according to progress for discussion. The most advanced, Kenya and Zambia, joined those who were furthest behind to share lessons learnt so far. She said that because both a partially and fully protective HIV vaccine were 'some time off', male circumcision was a vital tool, although 'hardly the holy grail'. In spite of this, after the period of abstinence during wound healing (about 3 weeks), 'there are no adherence issues, once the foreskin is gone it's gone. We just need to scale up'. She described these defenders as including couples' HIV counselling and testing and other risk reduction strategies like abstinence, partner reduction and using condoms. Praising the leadership on male circumcision at WHO and UNAIDS, Curran said they had consistently reminded the international HIV community and policy makers that the evidence on male circumcision was 'overwhelming and that this intervention needs to be scaled up for maximum impact'. Her unit's aim at Johns Hopkins University was to create the opportunities, an enabling environment and provide management support and motivation to countries willing to act on best evidence. Most of the medical male circumcisions in the 13-country region are being done under local anaesthesia using one of the three surgical techniques recommended by WHO: forceps-guided, dorsal slit and sleeve resection. The MC package developed there evolved into the now well-known international package used for training in most of the countries in the region. Curran's unit focuses on 'research to practice', working with health ministries globally and was originally funded for reproductive health and family planning. It has been involved in HIV work for 9 years, and its HIV work is primarily funded by the US President's Emergency Plan or AIDS Relief (Pepfar). Its speciality is training and quality assurance on clinical services, working side by side with Population Services International (known as the Society for Family Health in South Africa) which runs local clinics and does counseling and communication. Asked about the utility of including MC in South Africa's national health insurance package due for legislation next June and roll-out over 5 years, Curran said experience in the USA suggested that doing this had a major influence on the uptake of the service, affordability being a key component of access. She cited Medicaid (for low-income earners) in the USA. Those states that included neonatal circumcision in their MedicAid packages had much higher (24% higher on average) rates of neonatal circumcision than states which did not. Asked about human resource constraints, she said one element vital to Kenya's MC roll-out success was task shifting. 'They've advanced quickest because they've been very creative, using outreach mobile clinics staffed by nurses and "clinical officers" (mid-level workers). They also have excellent political leadership at provincial and national level with MC task forces and committees on each'. She said that in designing service delivery systems her unit went out of its way to minimise the impact of MC on other critical surgical services while keeping in mind the enormous number of procedures required for population-level impact on HIV incidence. MC went straight to the heart of health system strengthening, currently 'the buzzword' in public health. 'Simply put, HIV prevention is one of the best tools available for health system strengthening. HIV requires lifelong care and support and the extent to which we can reduce the number of people who will require ART frees up resources for other important interventions,' she added.